The Disappearing Nine Patch pattern is terrific for flannel. I find that flannel fabrics are more prone to stretching and distortion during cutting and sewing so can be frustrating to piece, however the Disappearing Nine Patch with its easy cuts and straight seams works great. 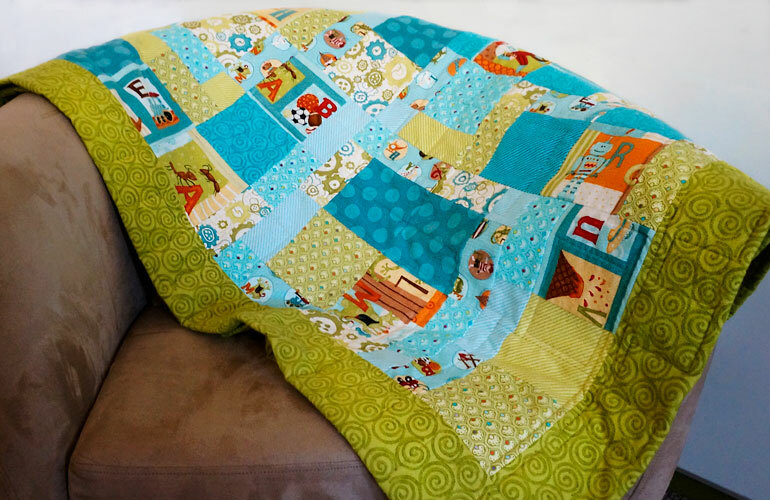 I really wanted to make a flannel quilt for my friend Susanne to enjoy during her pregnancy over the winter and using this pattern allowed me to focus on creating a soft, cuddly quilt without stress. Also, the Disappearing Nine Patch design is great for the bold colors and designs for wee ones now available in flannel. In preparation, I did some fussy-cuts from a panel to make about half of the corner squares for the nine patch. The “R” robot square to the right side of the above image being an example. When I assembled the blocks, after cutting the nine patch into quarters, I purposely placed similar blocks next to each other so the appearance of the block size variation is considerably more then the three sizes that are created initially. An example of this is the teal dot double-size block in the center of the image. The design assembly was really fun and I am super happy with the way the nine patch did indeed disappear.